TO MAINLAND ADDRESSES ENGLAND, WALES AND SCOTLAND SOUTH OF DUNDEE. FANTASTIC OFFER - WE HAVE A FEW OF THESE BEDS ON OFFER AT AN AMAZING DISCOUNT. The BED is made from quality Melamine coated board, it is not just paper covered. Children always needs storage and this bed has loads for kids of all ages. MADE TO BRITISH STANDARD EN747 THE BRITISH AND EUROPEAN STANDARD FOR HIGH SLEEPER BEDS. The main cabin bed carcase is made from White or Beech Colour quality Melamine coated board, it is not just paper covered board. A bigger cabin bed than our popular midi beds, this full height cabin bed is suitable for teenagers and adults. The bed has a built in ladder which avoids the risk of it becoming accidentally dislodged during the night. THIS CABIN BED HAS THE DESK / WARDBROBE AND DRAWERS THAT ARE NOT REVERSIBLE, IT CAN ONLY BE ASSEMBLED AS IN THE PICTURE. This exciting stylish children's high sleeper bed, which includes a bed base with'breathing' holes, takes a full 200 x 90cm x 15cm mattress (not supplied) and comes flat-packed for easy home assembly! The cabin bed, (also known as a high sleeper) is made to British and European Standards by ourselves in the UK and supplied to major European retailers. For safety reasons the maximum thickness of mattress for this bed is 15cm. The high sleeper bed has a wardrobe (83cm wide x 50cm deep) with a 80cm long hanging rail, a desk with three drawers and room for books on the shelves above. This a complete teenager/ childrens bedroom in one high sleeper cabin bed, with a full height desk that is 90 x 50cm. This high sleeper cabin bed was especially designed for older children and is not reccomended for children under 6 years of age. 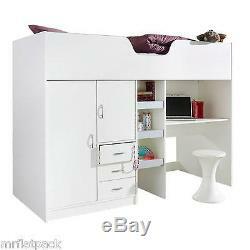 It has a total height of 151cm to the top of the bed. Loft bed style high sleeper cabin beds need to be made to a different standard than normal low beds for obvious safety reasons, the design tests include stability and ladder safety as part of the criteria. The loft cabin bed comes with full easy to read assembly instructions and, if necessary, a'help-line' contact number. The cabin bed is very robust when assembled. Mattress, Bedding and textiles ARE NOT included in the price. Bed measures approximately 203cm long x 94cm wide x 151cm high. We deliver to each area in cycle so these are maximum lead times. We can deliver to other areas, but it will cost a little more, please ask for a price before ordering. MADE IN THE UK FROM QUALITY MATERIALS. Please note our deliveries around holiday periods. Orders placed up to and over the x-mas period will be effected by our 11 day holiday. The item "BOURNE LOFT STYLE HIGH SLEEPER CABIN BED WHITE R1610W" is in sale since Thursday, September 1, 2016. This item is in the category "Home, Furniture & DIY\Children's Home & Furniture\Furniture\Bedframes & Divan Bases". The seller is "mrflatpack" and is located in Rutland. This item can be shipped to United Kingdom.